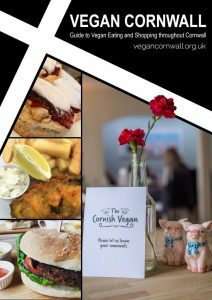 Online Guide to Vegan Eating and Shopping throughout Cornwall. We aim to include as many places as possible in this guide and keep it as accurate as we can. However, to a certain extent we have to take the information we are given on trust. If you are already a vegan you will know it’s always a good idea to check a certain dish is definately OK as recipes and chefs do change. Under each town, establishments are listed in order of greatness with our favourites listed first for their area. This may be because they are vegetarian, they label vegan, they are very accomodating to vegans or in some other way we consider them more accessible because predominantly the emphasis of this guide is on places to eat out. Of course, any restaurant worth their salt can cater for vegans with notice and to a limited extent, without. Some of the places we may not have visited and so this criteria is only meant as a guide. If you know of any hidden Cornish gems that are worthy of a mention but not listed please get in touch via the e-mail address given below. It is now possible to get vegan alternatives to just about everything such as milk, cream, yoghurt, chicken, fish, bacon, cheese and lots more. For further information on where to get specific products please e-mail us and we will endeavour to help. Please let us know if you have any information to add to the guide.